New & Selected Poems. W. H. New. Oolichan Books. Fergie, British Columbia. 2015. 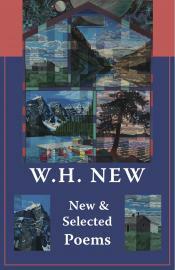 New & Selected Poems by the distinguished W.H. (Bill) New is the book of poetry everyone in Canada should take to the cottage for the summer. This is stuff you want to go back and browse like a catalogue full of goodies. Our guy Bill has been nominated for the Governor Generals Award and that doesn't happen by accident. Today's book of poetry enjoys New's easy calm with language regardless of the form he employs. Stylistically New ranges far and wide but his rational eagle eye is always in focus and the result is poetry that is always sharp. That and he can be so humanely tender without making us cringe. and shares with him her taste for bittersweet. Today's book of poetry has told you before how much we love W.H. Auden's "Musee des Beaux Arts" so when W.H. New takes a crack at Icarus in his poem "21. Safety" we were all ears. And New does not disappoint. He has 'the Knowledge'. New has an old cab driver's understanding of the ins and outs of things, the quickest way to get from one place to another with the smallest fuss. from dangerous fire & insubstantial air. between fear and safety, tumbling into the sea. Today's book of poetry is convinced of the deep and generous heart at the centre of W.H. New's New and Selected Poems. Robert Kroetsch has called New "the flaneur" and he is right on. These observational poems all point in one direction and we here at Today's book of poetry believe that direction is hope - we took an office survey at this morning's reading. "I Want To Talk About You" is blaring from one corner of our office to the other on this rather spectacular sunny spring morning here in the nation's capital. We have deep, deep respect for Saint John of Coltrane. One of the best things about running your own operation is having control of the music situation. Of course I usually let the minions have their way -- but I do remind them from time to time of the classics. Books like W.H. New's New & Selected Poems makes our job a cinch. 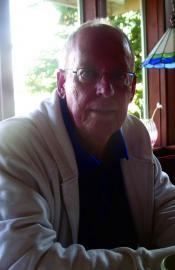 W. H. (Bill) New retired in 2003 as University Killam Professor at the University of British Columbia. A native of Vancouver, he earned an M.A. in Canadian Literature from UBC in 1963. In 1966 he was awarded his PhD from the University of Leeds, where he specialized in the English-language literatures of the Commonwealth. He then returned to the University of B.C. to set up a Commonwealth/ Postcolonial Literatures program. Honoured by the Killam Research and Teaching Prizes (1988, 1996), the Gabrielle Roy Award (1988), the Jacob Biely Prize (1995), the Association of Canadian Studies Award of Merit (2000), and the CUFA Award for Career Achievement (2001), he was elected to the Royal Society of Canada in 1986. In 2004 he was awarded the Governor General’s International Award for Canadian Studies and the Lorne Pierce Medal for his contributions to critical and creative writing. He has taught or lectured in Australia, China, France, Germany, India, Italy, New Zealand, Spain, the UK, and the USA. In 2002, The University of Toronto Press published his Encyclopedia of Literature in Canada. It has been praised in Canada and the UK for its innovative perspective and described in France as indispensable. In 2006 he was awarded the Order of Canada. Recently he received the 20th Annual George Woodcock Lifetime Achievement Award.